Essential oils have been used for centuries as a form of medicine, aromatherapy and skin care. Research by Grand View Research estimates that the global essential-oils market is expected to reach $11.67 billion by 2022. You may have heard of essential oils as a holistic method to help anything from stress relief to skin conditions, so it comes as no surprise that the market is constantly growing. The term essential oils refers to highly concentrated, aromatic oils extracted from plants by steam distillation or cold pressing. What ingredients are in essential oils? To create just one pound of essential oil, you’d be surprised at just how much plants are involved: 10,000 pounds of rose petals, 250 pounds of lavender, and 1,500 lemons! Inside one drop of essential oil is a delicate balance of components that all make up the components of a complete oil. Think of it like a fingerprint. Distillation and cold pressing are the simplest, pure way to extract oils from plants. Using steam, it vaporizes the plant’s aromatic compounds into an oil that can be used. With cold pressing, similar to juices, the plants are mechanically pressed and centrifuged to extract the oils. What should I look for in an oil? When choosing oils, you want to look for the highest quality essential oil you can find that is sustainably sourced, because oils are absorbed through the skin. Be sure the oil is pure and contains only plant compounds, without additives, chemicals or synthetic oils. You’ll notice that these pure oils generally have the plant’s botanical name written on the label. Are any oils dangerous to consume or use topically? There are certain oils that you should never use on your skin or consume: sassafras, calamus and wormwood. You can reference the U.S. Food and Drug Administration’s (FDA) Generally Recognized as Safe (GRAS) list for oils that are safe to consume. For those that are safe, a good rule of thumb is to keep oils away from your eyes, ears, nose and mouth. How long should I keep my essential oils? Throw out oils that are older than three years, because oxygen can spoil them. Depending on the oil, you can use them in several different ways. To freshen a room, use an essential oil diffuser. For oils that are safe for topical use, blend a few oils into a roller, and use on skin. The most popular spots to apply are your temples, feet, and chest. Find a practitioner that can use the oils in an aromatherapy massage. 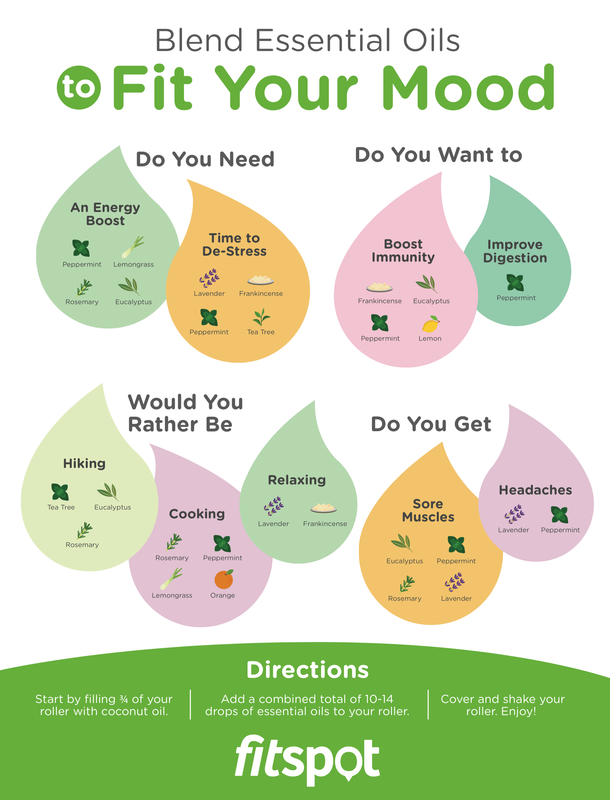 Find out how to blend essential oils to fit your mood with this infographic!